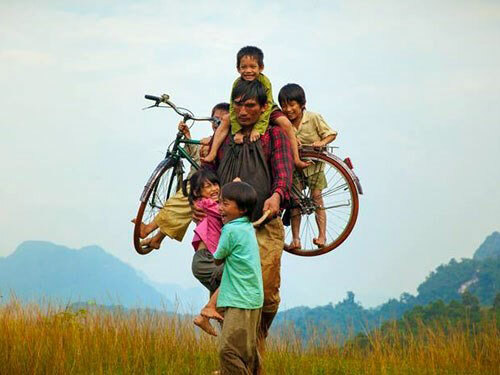 Paternal themed film Father and Son, directed by Luong Dinh Dung, will compete and be screened at the 15th Boston International Film Festival. The festival is being held from April 13 to 17 in Massachusetts, the US. Father and Son is an independent movie adapted from Dung’s short story titled Father and Son, written in 1995. The movie will compete against other foreign films from all over the world in 17 categories. “BIFF is one of the significant cinema events that Father and Son is proud to attend since the movie’s release,” said director Dung. “I did not expect my movie to be selected; therefore I was surprised and so happy to have the opportunity to promote Father and Son to the American audience. If things go smoothly, the Vietnamese audience can watch the film in cinemas by the middle of the year,” said Dung. The main character in the movie is a little boy named Ca. He lives with his blind father, who has spent his entire life by the river. Ca’s world revolves around the river and everything associated with it, including the animals, flowers and the wooden fish his father carved for him. Ca dreams of touching the clouds in the sky and of visiting fancy lands as in the fairy tales told by his father. However, Ca suffers from an incurable disease and cannot wait for the day his father has enough money to take him to the doctor. Dung drew inspiration for the story from his own experiences to write Father and Son in 1995. BIFF is an annual film festival held in the city with the participation of short and long films from all over the world. Participating films this year were selected from over 3,000 entries. They will compete for prizes in 17 categories. Earlier, in 2012, Cham (Touch) film directed by Vietnamese-American Nguyen Duc Minh was also screened and won the Best Cinematography prize at BIFF. Film Tam Cam: Chuyện chưa kể (Tam Cam: The untold story), directed by Ngo Thanh Van, will, meanwhile, be screened at the Osaka Asia Film Festival to be held from March 3 to 12. There are 16 films from Hong Kong, Taiwan, the Philippines and Thailand, as well as the Republic of Korea, Indonesia, India, mainland China and Japan competing at the Osaka Asia Film Festival this year./.